For the Illinois village once known as Charleston, see Brimfield, Illinois. Charleston is a city in and the county seat of Coles County, Illinois, United States. The population was 21,838, as of the 2010 census. The city is home to Eastern Illinois University and has close ties with its neighbor, Mattoon. Both are principal cities of the Charleston–Mattoon Micropolitan Statistical Area. Location of Charleston in Coles County, Illinois. Native Americans lived in the Charleston area for thousands of years before the first European settlers arrived. With the great tallgrass prairie to the west, beech-maple forests to the east, and the Embarras River and Wabash Rivers between, the Charleston area provided semi-nomadic Indians access to a variety of resources. Indians may have deliberately set the "wildfires" which maintained the local mosaic of prairie and oak–hickory forest. Streams with names like 'Indian Creek' and 'Kickapoo Creek' mark the sites of former Indian settlements. One village is said to have been located south of Fox Ridge State Park near a deposit of flint. The early history of settlement in the area was marked by uneasy co-existence between Indians and European settlers. Some settlers lived peacefully with the natives, but conflict arose in the 1810s and 1820s. After Indians allegedly harassed surveying crews, an escalating series of poorly documented skirmishes occurred between Indians, settlers, and the Illinois Rangers. Two pitched battles (complete with cannon on one side) occurred just south of Charleston along "the hills of the Embarrass," near the entrance to Lake Charleston park. These conflicts did not slow American settlement, and Indian history in Coles County effectively ended when all natives were expelled by law from Illinois after the 1832 Black Hawk War. With the grudging exception of Indian wives, the last natives were driven out by the 1840s. First settled by Benjamin Parker in 1826, Charleston was named for Charles Morton, its first postmaster. The city was established in 1831, but not incorporated until 1865. When Abraham Lincoln's father moved to a farm on Goosenest Prairie south of Charleston in 1831, Lincoln helped him move, then left to start his own homestead at New Salem in Sangamon County. Lincoln was a frequent visitor to the Charleston area, though he likely spent more time at the Coles County courthouse than at the home of his father and stepmother. One of the famous Lincoln-Douglas debates was held in Charleston on September 18, 1858, and is now the site of the Coles County fairgrounds and a small museum. Lincoln's last visit was in 1859, when the future President visited his stepmother and his father's grave. Although Illinois was a solidly pro-Union, anti-slavery state, Coles County was settled by many Southerners with pro-slavery sentiments. In 1847, the county was divided when prominent local citizens offered refuge to a family of escaped slaves brought from Kentucky by Gen. Robert Matson. Abe Lincoln, by then a young railroad lawyer, appeared in the Coles County Courthouse to argue for the return of the escaped slaves under the Fugitive Slave Act in a case known as Matson v. Ashmore. As in the rest of the nation, this long-simmering debate finally broke out into violence during the American Civil War. On March 28, 1864 a riot—or perhaps a small battle—erupted in downtown Charleston when armed Confederate sympathizers known as Copperheads arrived in town to attack half-drunk Union soldiers preparing to return to their regiment. In 1895, the Eastern Illinois State Normal School was established in Charleston, which later became Eastern Illinois University. This led to lasting resentment in nearby Mattoon, which had originally led the campaign to locate the proposed teaching school in Coles County. A Mattoon newspaper printed a special edition announcing the decision with the derisive headline "Catfish Town Gets It." Thomas Lincoln's log cabin has been restored and is open to the public as the Lincoln Log Cabin State Historic Site, 8 mi. south of Charleston. The Lincoln farm is maintained as a living history museum where historical re-enactors depict life in 1840s Illinois. Thomas and Sarah Bush Lincoln are buried in the nearby Shiloh Cemetery. On May 26, 1917, a tornado ripped through Charleston, killing 38 and wounding many more along with destroying 220 homes. Charleston is located at 39°29′5″N 88°10′41″W﻿ / ﻿39.48472°N 88.17806°W﻿ / 39.48472; -88.17806 (39.4846183, -88.1779604). According to the 2010 census, Charleston has a total area of 9.63 square miles (24.94 km2), of which 8.92 square miles (23.10 km2) (or 92.63%) is land and 0.71 square miles (1.84 km2) (or 7.37%) is water. As of the census of 2010, there were 21,472 people, 7,972 households, and 3,329 families residing in the city. The population density was 2,632.2 people per square mile (1,016.7/km²). There were 8,794 housing units at an average density of 1,019.4 per square mile (393.7/km²). The racial makeup of the city was 90.4% White, 5.7% African American, 0.1% Native American, 2.4% Asian, 0.0% Pacific Islander, 0.9% from other races, and 0.6% from two or more races. Hispanic or Latino of any race were 2.2% of the population. There were 7,972 households out of which 20.2% had children under the age of 18 living with them, 33.9% were married couples living together, 7.3% had a female householder with no husband present, and 56.6% were non-families. 34.6% of all households were made up of individuals and 9.5% had someone living alone who was 65 years of age or older. The average household size was 1.75 and the average family size was 2.44. In the city, the population was spread out with 9.8% under the age of 18, 44.1% from 18 to 24, 18.7% from 25 to 44, 13.7% from 45 to 64, and 7.9% who were 65 years of age or older. The median age was 21.9 years. For every 100 females, there were 86.9 males. For every 100 females age 18 and over, there were 84.5 males. The median income for a household in the city was $21,849, and the median income for a family was $49,625. Males had a median income of $30,906 versus $21,822 for females. The per capita income for the city was $15, 544. About 17.4% of families and 41.1% of the population were below the poverty line, including 8.7% of those under age 18 and 11.8% of those age 65 or over. Charleston is home to Eastern Illinois University, which has roughly 7,500 undergraduate and graduate students. 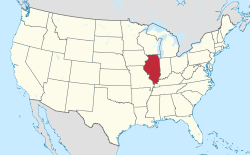 Additionally, Eastern Illinois hosts the Illinois High School Association's Girls Badminton, Journalism, and Girls and Boys Track and Field State Finals. Jimmy John Liautaud founded the first Jimmy John's restaurant in Charleston in 1983, occupying premises near the corner of Fourth Street and Lincoln Avenue. Charleston is served by Charleston Community Unit School District 1, one of three school districts located in the county of Coles. The district itself is composed of six schools: Ashmore Elementary School (PreK-4), Mark Twain Elementary School (PreK and K), Carl Sandberg Elementary School (1-3), Jefferson Elementary School (4-6), Charleston Middle School (7-8), and Charleston High School (9-12). Eastern Illinois University is a public university in Charleston and has served the community since 1895. See also Eastern Illinois University#Notable alumni for a list of people who lived in Charleston while attending EIU. Joshua Scott Jones, Big Machine Records recording artists (country music) and one-half of the duo "Steel Magnolia"
Larry Stuffle, member of the Illinois House of Representatives from 1977-1985. He was born in Charleston and represented the area in the Illinois House of Representatives. Gregg Toland, cinematographer of Citizen Kane and Wuthering Heights (for which he won an Oscar), was born and raised in Charleston. ^ "The Mattoon/Charleston Tornado of May 26, 1917". National Weather Service. NOAA. Retrieved 9 December 2012. ^ "Charleston, Coles County, September 18, 1858". The Lincoln-Douglas Debates. The Lincoln Institute. Retrieved 9 March 2014. ^ "Fourth Debate: Charleston, Illinois". Lincoln Home National Historic Site. National Park Service. Retrieved 9 March 2014. ^ "G001 - Geographic Identifiers - 2010 Census Summary File 1". United States Census Bureau. Retrieved 2015-12-26. ^ "EIU - IHSA State Championships". www.eiu.edu. Retrieved March 21, 2019. ^ "Charleston CUSD#1 School District" (PDF). www.charleston.k12.il.us. Retrieved March 21, 2019. ^ "Larry Ray Stuffle 1949-2016". The State Journal-Register. January 18, 2016. Retrieved February 14, 2019. Wikimedia Commons has media related to Charleston, Illinois. Wikisource has the text of a 1911 Encyclopædia Britannica article about Charleston, Illinois. "Charleston, a city of Illinois" . Collier's New Encyclopedia. 1921.